Your personal shopping assistant! BuyFood is a compact app for your shopping list, storage and recipe collection. 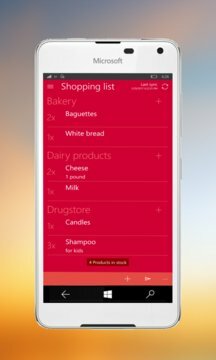 All functions of the app are intertwined, purchased products appear immediately in your stock, optionally also with shelf life. Apply recipes to quickly add ingredients to the shopping list. Through the Live Tile of the app, you are always informed whether products are running in the near future.